simplifies the composing of single select statements. The interface can be used for composing single SELECT statements without knowing the structure of the used query. appends a new filter condition by a com::sun::star::sdb::DataColumn providing the name and the value for the filter. The value property must be supported by the com::sun::star::sdb::DataColumn. filterOperator The operator used, is defined by com::sun::star::sdb::SQLFilterOperator. com::sun::star::sdbc::SQLException if a database access error occurs. appends an additional part to the group criteria of the select statement. The column must be a com::sun::star::sdbcx::Column. appends a new HAVING filter condition by a com::sun::star::sdb::DataColumn providing the name and the value for the filter. appends an additional part to the sort order criteria of the select statement. ascending TRUE when the order should be ascending, otherwise if FALSE descending. makes it possible to set a filter condition for the query. com::sun::star::sdbc::SQLException if a database access error occurs or the statement isn't valid or the statement isn't parsable. makes it possible to set a group for the query. makes it possible to set a HAVING filter condition for the query. makes it possible to set a sort condition for the query. com::sun::star::sdbc::SQLException if a database access error occurs or the order isn't valid or the statement isn't parsable. appends a new set of filter criteria which is split into levels. filter The filter criteria is split into levels. Each level represents the OR criteria. Within each level, the filters are provided as an AND criteria with the name of the column and the filter condition. The filter condition is of type string. The operator used, is defined by com::sun::star::sdb::SQLFilterOperator. appends a new set of HAVING filter criteria which is split into levels. filter The HAVING filter criteria is split into levels. Each level represents the OR criteria. Within each level, the filters are provided as an AND criteria with the name of the column and the filter condition. The filter condition is of type string. The operator used, is defined by com::sun::star::sdb::SQLFilterOperator. An elementary query or statement is a (single select) statement whose parts are not covered by the various set and get methods of the composer. That is, if the elementary statement contains a filter clause, a call to XSingleSelectQueryAnalyzer::getFilter() will not return you this filter. Instead, only filters which have been set using for instance setFilter() are covered by the get methods. 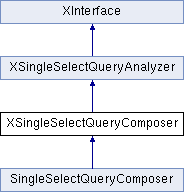 The only methods which take all parts of the elementary statement into account are XSingleSelectQueryAnalyzer::getQuery() and XSingleSelectQueryAnalyzer::getQueryWithSubstitution(), which always returns the complete composed query. As a result, you can use the composer to build cumulative filter expressions. That is, you can set ElementaryQuery to a statement already containing filters, and then use setFilter() to append additional filters. The very same holds for sort orders, HAVING and GROUP BY clauses. There are various use cases for this. For instance, you might want to use the statement represented by a QueryDefinition, and extend it with additional filters or sort orders, while not touching the respective parts already present in QueryDefinition::Command. This can be achieved by setting the QueryDefinition::Command as ElementaryQuery of a SingleSelectQueryComposer. If, in such a scenario, you would be interested in the filter part of the QueryDefinition::Command, you would set it via XSingleSelectQueryAnalyzer::setQuery(), and retrieve the filter part via XSingleSelectQueryAnalyzer::getFilter(). If you'd be interested in the composed filter, you would set the QueryDefinition::Command as ElementaryQuery, add your filter, and propagate the resulting query (XSingleSelectQueryAnalyzer::getQuery()) to an SingleSelectQueryAnalyzer instance via XSingleSelectQueryAnalyzer::setQuery().